Are Other Christians Not True Churches? What is the true Church? Are Other Christians Not True Churches? Even the most holy of the Roman pontiff (if there be one) does not have any right judging those outside the church, granting (without accepting) that the RCC is the true church.God judges those that are without or outside the church of the Bible. This claim is highly unscriptural, considering the fact that the RCC has not reached all nations of the world in its almost 2 millennia of history.Justice and equity calls for love and compassion.We do not have the right to judge people to whom we have not yet shared the truth.The apostolic teaching is, those who were not reached by the preaching of the gospel, but are doing the things contained in the law, even if they have not yet heard the law, they will be justified. What is apostolic, is to believe that there is justification (or salvation) for those who, while they have not heard the law, but are doing the things contained in the law written by God in their conscience, God is fair, compassionate, and just (not like all the popes in Rome who carelessly judge those outside their church).God can save even those who have no faith. Notice the phrase “especially of those that believe“.God can save even those who are incapable of believing. Can a child or a babe have faith?Can a moron, a Mongoloid, or a mentally retarded believe? But God can definitely save them — even if they do not join the Catholic Church.In fact, the very recent findings (but very much delayed biblically) of the International Theological Commission (ITC) said that babies who died without baptism will go to heaven, thus, belying the centuries-old erroneous, non-apostolic and non-biblical belief of limbo.This pope is certainly not of a sound memory. He forgot the most famous and influential product of the Second Vatican Council (Lumen Gentium 8). Are babies born of Jewish and non-Christian parents qualified to enter heaven?If they are, then they are not members of the Catholic Church, so, the conclusion of the pope that outside the RCC has “no means of salvation” is false!God has it, because He is the only qualified judge and not anybody else outside of The True Church; which certainly is not the Roman Catholic Church, because its teachings are not apostolic. If the teachings of a church are apostolic, they must conform to the most fundamental apostolic teachings in the Bible. They must be written in apostolic epistles or books. We must learn them directly from the writings of the apostles! 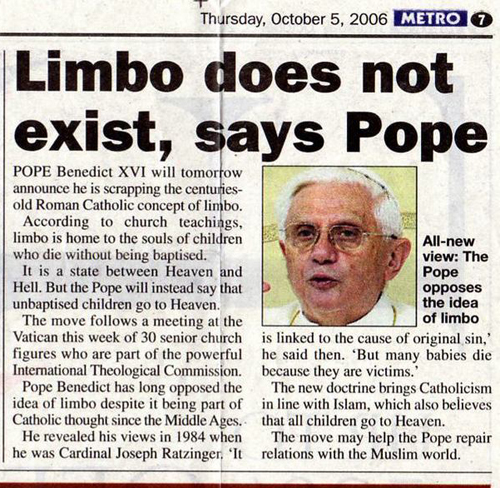 Accepting any teachings not written by the apostles like limbo and purgatory is being non-apostolic! Remember, God will judge and not the pope! So, is the statement of Pope Benedict XVI, that other Christians outside the Roman Catholic Church are not true Christians, biblically correct? I vehemently disagree! We will prove in another article that Catholicism is not Christianity.